Monday August 5th 1895 I put in the whole forenoon sweeping and dusting the house. Will brought Laura home at noon. we spent the afternoon visiting I sewed a little. Tuesday August 6th 1895 Will went this morning to take three steers he had bought to the valley pasture. I fixed some things to take to the church. Laura and I went down early. I spent most of the afternoon over the river. 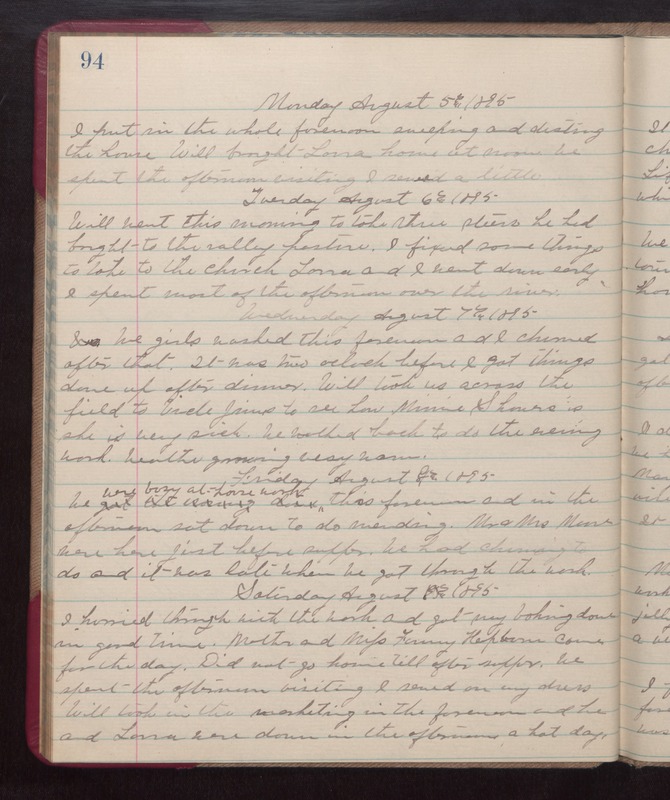 Wednesday August 7th 1895 We girls washed this forenoon and I churned after that. It was two oclock before I got things done up after dinner. Will took us across the field to Uncle Jims to see how Minnie Shours is. she is very sick. We walked back to do the evening work. weather growing very warm. Friday August 8th 1895 We were busy at house work this forenoon and in the afternoon sat down to do mending. Mr & Mrs Moore were here just before supper. We had churning to do and it was late when we got through the work. Saturday August 9th 1895 I hurried through with the work and got my baking done in good time. Mother and Miss Fanny Hepburn came for the day. Did not go home till after supper. we spent the afternoon visiting I sewed on my dress. Will took in the marketing in the forenoon and he and Laura were down in the afternoon. a hot day.